As we ventured into 2019, one principle we’ve adopted is that of information symmetry. In the pursuit of hitting deadlines, being first to market and a relentless focus on outcomes, a natural rift occurred in 2018 between us, our partners and external contributors. As we examined this rift, it became clear that the primary drivers were too few people having access to important information that would have helped drive their decision making. To adapt to this we’ve experimented internally with a ceremony we call the “Showcase”. 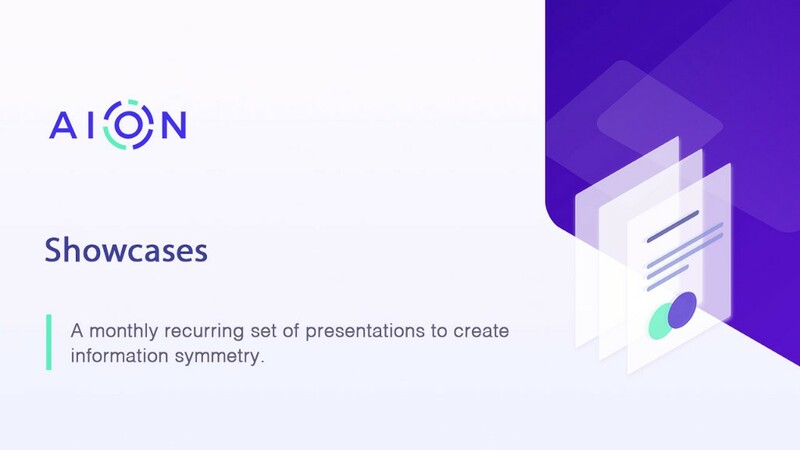 Showcases are an opportunity for Aion Foundation teams to share progress they’ve made in the previous four week period. They come prepared with talking points in a consumable group format that covers a 10 minute period (presentation, demo, etc.) In attendance are the members of the presenting “pod” and all “pod leads”. 10 min — present/demo what you’ve accomplished in the previous 4-week period, snapshot of what’s coming in the next 4 weeks. As our first few rounds of showcases have gone well and we’ve ironed out the wrinkles, now is as good a time as ever to make them public. The goal being an increase in the surface area of exposed third parties to the inner workings of the Foundation. If you know what “pods” are working on, you can adapt your efforts to help us in the problem domains we are focusing on. We will keep archived showcases in a reference section in our roadmap going forward. Disclaimer: Some of this content are in early stages of exploration and as a result are not always commitments to outcomes. Much of the content is sourced across the Aion ecosystem and is not controlled or managed by the Aion Foundation. Not all questions have answers immediately and teams take those questions back with them. Notes are not exhaustive and are purposefully raw, it is our hope that summaries and higher fidelity highlights will be generated by those who are interested in curating this. Productizing docs, stripe has been a source of inspiration for this. All documentation is oriented around the problem facing the developer. Community notes, need to focus on some of the common questions of the community and to have more presence meetups. Sam: Productizing docs, is this common use case or common components? Matt: How do we stay relevant on the components? Sam: How do we prioritize the components we can be competitive on? Matt: We should be highlighting outward facing personalities. How do we get people in the community to know them? Current timelines for milestones upcoming leading to a MainNet hard-fork to AVM. Matt: Dates, April specifically is day two of conference so be aware of our capacity here. Ian: For the flexible date on MainNet hardfork, how do we decide this date? Matt: Differentiating factors from us vs solidity? Our product launch page is a good representation of how we’re thinking about this. IntelliJ plugin for Java contracts, testing, debugging and deploying to embedded AVM, send transactions. Ian: What are we playing catch up on, and what are we “feature advanced” on when it comes to tooling and layer 2? Makki Wallet, is this Aion branding? Some suggestions from the group around demo application and more. Will not work: Local Posterior Checkpoint, Too fragile, too easy to force fork of the network. Might work: Pseudo-PoS using VRF, this is potentially a net new solution we should explore more. Matt: Is there a mechanism you’re proposing to reduce the global message propagation? You need organizations of communication so that not everyone is talking to one another at the same time. We tried to make it lean and minimize our effort. We wanted to involve stake, since it has better properties. DCred model has less changes to the software pools are running, we would only need to change payouts. Miners would get existing or more reward plus stake, which is a change in monetary policy. You incur a set of operational and co-ordination expenses when approaching any staking approach, user experience is very important here. Jeff: We need a solution like this, this year. I have a lack of confidence in sharding approaches, this may be less of an interim solution than sharding and ETH 2.0. Matt: How far are we from a conversation about next steps? Let’s get to a proposal. Showcase — A new monthly ceremony was originally published in Aion on Medium, where people are continuing the conversation by highlighting and responding to this story.